A couple of weeks later we had a casting lesson sorted and I met Maggi who turned up with the rod and reel she’d bought and explained why she wanted to learn to cast. Her late father used to fish and whilst he never taught her to fish, it was now something she wanted to try since she enjoys the outdoors so much. We started as we always do at The School Of Fish with the casting lesson basics and made sure the rod and reel were all set up correctly. We made sure all the guides/eyes on the telescopic rod were lined up to aid the smooth release of line during the cast. Next we talked through the casting clock face and the importance of 10 o’clock and 2 o’clock positions. We rehearsed the casting movements and then introduced the finger release and the all important timing. With everything starting to flow and Maggi’s confidence growing we then added a large polystyrene float to the line that gave just enough weight for an initial cast but crucially the large float was very visible to Maggi could the effects of her cast easily. The first casts weren’t far but they were perfectly straight and that’s all we were looking for, controlled, accurate casts. Very quickly we could add a small weight and the small steps started to make a big difference in Maggi’s casting distance. When everything clicked the casts started to flow out effortlessly and still perfectly straight, just as they should. 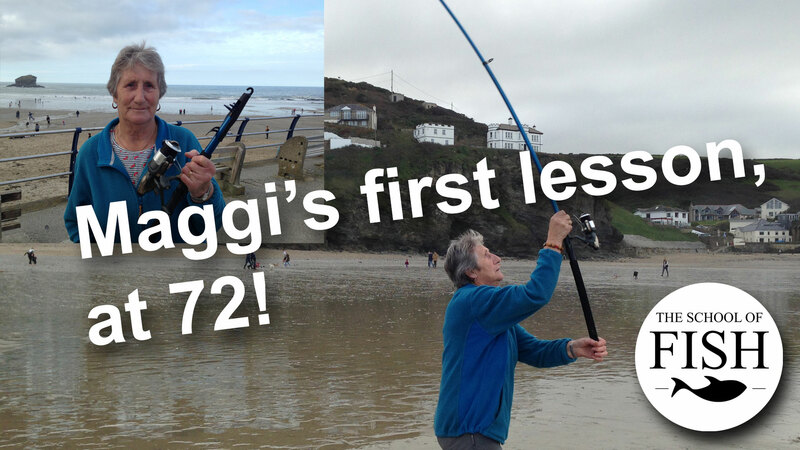 Finally, with enough weight to properly load the rod we were using, the casts started to really fly and in just 45 minutes Maggi had gone from complete novice to confidently, safely and consistently casting a distance that will catch anything that swims too close. An absolute pleasure of a casting lesson and I’m looking forward to hearing from Maggi when she catches her first fish. Happy Birthday for next week Maggi, 73 years young!